"Clearwater Beach Splendor" Pool Home! Short Walk to Beach! 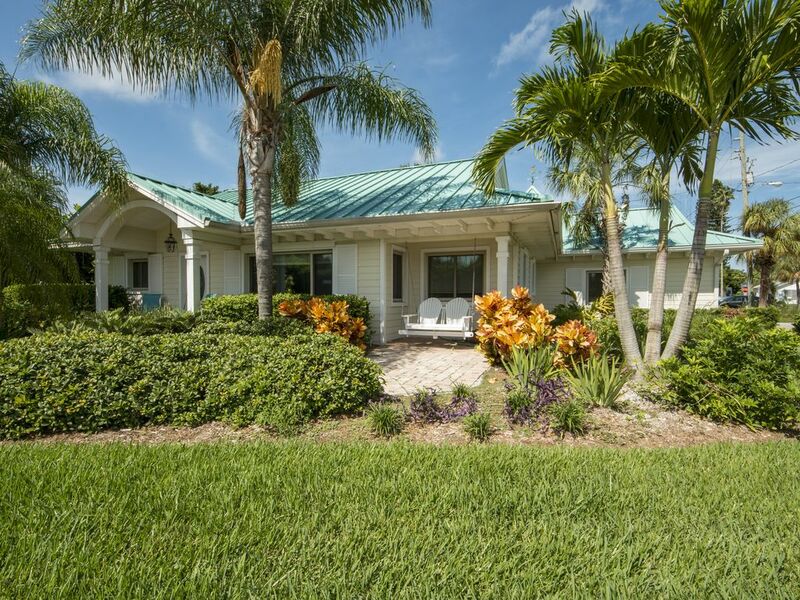 Private Key West Style Beach Home! Location: 934 Narcissus Avenue, Clearwater Beach, FL. Absolutely Charming! Spectacular and Clean! Beautifully Remodeled! The Green Tin Roof, White Shutters and Porch Swing will Make You Feel and Know That You Are On Vacation! Short walk to "The Best Beach on the Gulf of Mexico!" Walk one block to Intercoastal Waterway - enjoy fishing and relax! Beautiful family POOL! ; Great residential Neighborhood! Short direct walk to Beach! Free WIFI Internet. RATES: Rates are subject to change until booked and deposit paid. We require a 3 to 7 day minimum stay depending on time of year. Seven day rental periods begin and end on Saturday. Deposit payment is due at time of booking for each week or partial week booked. Remaining balance is due 60 days prior to arrival. The property is not reserved until full deposit is made. EXPLORE the miles of Beautiful Beaches and Beach Communities along the Gulf Coast. Take advantage of the Jolley Trolley Service to all beach activities, shops and restaurants! DAY TRIPS TO NEARBY FLORIDA THEME PARKS such as Busch Gardens (45 minutes), Disney World, MGM or Sea World (90 minutes)! CLEARWATER BEACH - HOME OF "WINTER AND HOPE" - THE FAMOUS DOLPHINS! Our home is located a short distance from the Clearwater Marine Aquarium. When we started looking for a property we fell in love with the North Clearwater Beach area. The people are friendly and it is wonderful being so close to the The Best Beach on the Gulf of Mexico and to the Inter-coastal Waterway. It is convenient and inexpensive to fly in and out of the Tampa Bay airport. Our four bedroom pool home is a great place for a family vacation! We purchased this property because we love the Clearwater Beach area and the location of our home is great! You will love relaxing and enjoying our quiet residential neighborhood near to shops, restaurants, beach, and the fun activities that Clearwater Beach has to offer! Our home is clean and beautifully maintained inside and out. Clearwater Beach Splendor is fully furnished and has many extras including highchair, porta crib, beach toys, pool toys, books, movies, games, beach towels, charcoal grill, beach chairs etc. Please enjoy the comforts of our home!!! We have parking for 3 mid-size vehicles. Queen Size Sleeper located in living Room. Two dining areas in home. See Video and pictures for more details. 4 televisions in home. One in living room, one in three different bedrooms. Beautiful heated pool with child wading area. Spacious 1900 Square Feet of Living area! Beautiful heated family Pool!!! Fully Loaded Kitchen! Large Flat-screen TV! Full Laundry Room with Washer and Dryer! Charming Decor! Beautifully Furnished!, Includes Free WIFI Internet, Central Air Conditioning, Portable Play Crib, High-chair, Deck, Charcoal Grill, You will LOVE our Home! No Smoking please! Great area to be in. Neighborhood is so clean and private. Close proximity the beach and what beautiful beach! The house was very clean and plenty of room. Pool was kept clean and had regular cleaning service. only shortcomings was the kitchen being outdated and musty! Furniture is kind of old as well... Outside of that, place was a great place to stay! This home was just what we needed after running the Disney Marathon. We had 4 adults and 4 small children staying and there was plenty of room. The home layout is perfect for 2 families (2 rooms on one side, 2 rooms on the other). There were so many games and puzzles for the kids they would have been happy staying inside all day. The beach is just steps away and it was beautiful! The sand is amazing! It was a little colder than we would have liked but we bundled up and made the most of it. The home owners provided plenty of beach items (toys, towels, chairs, cooler, puddle jumper life vest, and a wagon to haul it all there). The home’s pool was another awesome feature. There was a nice shallow area where the little kids could play and then a good sized deeper area. The pool is heated and felt great after the marathon. Beds were comfortable. Plenty of towels and blankets. Everything about this place was amazing!! -The rental company emailed about 5 times a day. Not sure if this was intentional but there was never any new info when I clicked the link. A little annoying. -also only one roll of paper towels and one garbage bag per garbage. Nothing that would prevent us from staying again. But just things that are nice to know prior to getting there. Overall we had a fantastic time! We will definitely be back! Great house with lots of amenities for staying there and exploring the beach. Would do again if back in the area. Stayed here with some friends. We came into town for Steelers game and stayed here Friday thru Tuesday. The house was beautiful. And the pool was much bigger than I thought it would be from pictures. We had a great time hanging out by the pool and playing cards inside while at the house. The bars and restaurants were also easily accessible. The beach was a short ten minute walk. All in all a great trip that delivered everything that was promised. Small maintenance issue handling in 15 minutes on a Sunday impressive. Would definitely recommend the Splendor and hope to return soon. BEAUTIFUL BEACHES: Enjoy walking and exploring miles of beautiful pristine beaches along the Gulf Coast! Collect sea shells and sand dollars, sunbathing, floating on a raft, exploring remote Florida nature trails. SUNSETS: Spectacular Florida sunsets! ENTERTAINMENT: Numerous restaurants, Great shopping, Dinner Cruises, Pirate Ship Cruises, Sipping Pina Coladas at a Tiki Bar, Nightly Entertainment at Pier 60, numerous family/adult/child activities. SPORTS: Miniature Golf, Golfing, Beach activities. BOATING: Skiing, Deep Sea Fishing, boat to the Tropical Islands and Sand Bars, Kayak Adventures. WATER SPORTS: Swimming in our private heated pool, Snorkling, Scuba Diving, Swimming in the Gulf of Mexico, jet-skiing, beach games. ENJOY FLORIDA'S NATIVE WILDLIFE: Porpoises, Sea Turtles, Manatees, Birds (cranes, egrets, parrots, pelicans, sea gulls, sandpipers). FISHING: Fish for makarel, snook, sheepshead, sea bass, cast net for mullet!!! Rates are subject to change until booked and deposit paid. We require a 3 to 7 day minimum stay depending on time frame requested. Seven day rental periods begin and end on Saturday. Pinellas County Tax rates is 13%. We require a three to seven day minimum rental period depending on time frame requested. Seven day rental periods begin and end on Saturday.